Pressed for time? Listen instead! Everything is moving to a digital or online interface: we use email or text messaging instead of writing handwritten letters; we log onto an online bank profile instead of visiting an ATM; we register for webinars instead of driving to a seminar. Let’s talk about online accounting software. A small business needs to operate at maximum efficiency which is not always possible with offline software. Plus, as more consumers choose online options, the desktop software may eventually phase out, so you probably don’t want to keep clinging on to it for much longer. Here are the top benefits of online accounting platforms. #1 Anytime access. You get 24/7 online access, which means you don’t have to worry about your desktop accounting software crashing or freezing and not being able to log in. #2 Automatic backups. No need to create a backup file manually. You can sit back and relax knowing it’s handled for you. #3 Mobile application. It does not force you to bring your computer to open your file. Just log into the mobile app to access your data on your phone or tablet. #4 Free upgrades. 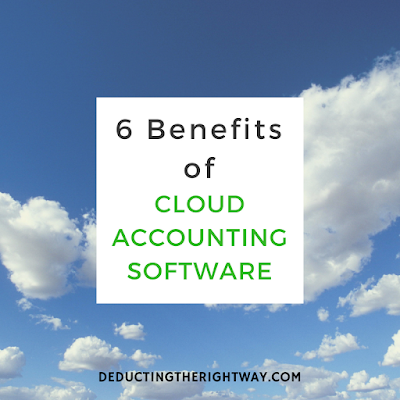 With cloud accounting, you avoid installing updates or buying a new version which is what you’ll face with desktop accounting. #5 Collaborative environment. Online accounting software lets multiple users work at the same time. Your offline accounting software also has multi-users, but it’s more tedious and usually an added expense to set it up. #6 Third-party apps. Depending on your accounting software provider, you can choose from hundreds of apps that enhance your experience. Desktop software has fewer integration options.